Science Centre Station will be an underground station and Mobility Hub, located at the intersection of Don Mills Road and Eglinton Avenue East. The station will include an off-street TTC Bus Terminal. 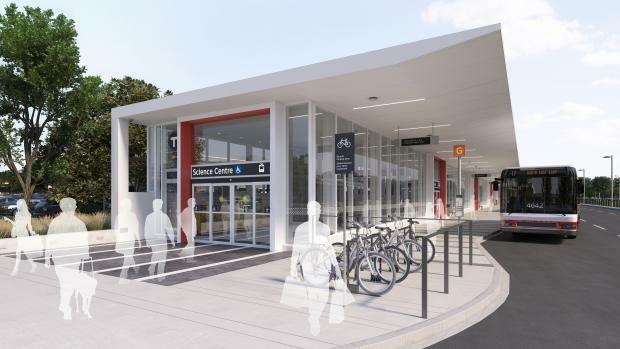 There will be two fully accessible entrances – the main at the southwest corner of Eglinton Avenue and Don Mills Road, and the secondary entrance, incorporated into the bus terminal on the northeast corner of Eglinton and Don Mills Road. The bus terminal will include seven bus bays for TTC buses, with on-street bus connections. There will also be an underground, accessible connection to the LRT concourse level, along with retail spaces at this level. There will be 30 outdoor and 30 indoor bicycle parking spaces. The main entrance will be adjacent to the Ontario Science Centre and will have access from both the north and south sides of the building. The footprint of the main entrance and bus terminal will be minimized to protect for future adjacent development in this area. The main entrance will be designed to reflect its physical and visual connection to the East Don Valley, including foundation plantings along the perimeter of the main entrance building. The bus terminal will have a linear configuration to allow pedestrians to access the bus terminal from both Don Mills Road and Gervais Drive.